MJ Medical has been appointed as the medical equipment and furniture procurement consultant for the Defence and National Rehabilitation Centre (DNRC) – currently under construction near Loughborough and set to open in 2018. When operational next year, the DNRC will be one of the world’s most sophisticated centres for clinical rehabilitation treating injured Service personnel and with the potential for a complementary ‘National’ facility to treat civilians on the same site. The DNRC is at Stanford Hall near Loughborough with the site carefully chosen for the express purpose of delivering the best in clinical rehabilitation for those who have experienced serious injury. The Defence facility is being financed and built through charitable donations and was the idea of the late Duke of Westminster. It will be operated by the Ministry of Defence which will pay the running costs. MJ Medical was contracted by BS Stanford, the company set-up by the Black Stork Charity to deliver the project. The leading health planning consultancy will work closely with Arup, the programme advisor, manager and engineer, and the Ministry of Defence. Its role will include leading the procurement, installation and commissioning of medical equipment and furniture. When it becomes operational in 2018, the Defence facility will provide the best in clinical rehabilitation treatment within a bespoke and purpose-planned setting. It will provide the latest technology and treatments in the field of clinical rehabilitation, as well as delivering effective clinical care to those that need it. The Stanford Hall Estate site was specifically selected due to its size, location and setting. It is close to established centres of medical expertise including the QE2 Hospital in Birmingham (where seriously injured members of the Armed Forces are initially treated when injured) and it is large enough to accommodate the planned development of the complementary National facility on the same site. The setting is semi-rural with the bespoke new buildings surrounded by parkland and within a tranquil landscape which provides the ideal backdrop to support the holistic healing process. At the same time, the location is sufficiently close to Loughborough, Nottingham and other urban centres to ensure that patients do not feel remote. 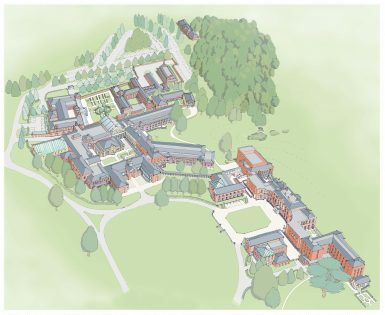 The DNRC will replace the existing Defence medical facility at Headley Court which was established in the 1940s with personnel and expertise transferring to the new Stanford Hall site. The DNRC has been designed and planned working in close conjunction with experts from Headley Court and is expected to be the next generation of Defence clinical rehabilitation capability. It will provide inpatient and outpatient services for musculo-skeletal injury, complex trauma injury, neurological injury, cardiac condition and rheumatological conditions.